The Umayyads erected a number of characteristic palaces, known in Arabic as qusur (pl. )/qasr (sing. ), some in the cities, but mostly in the semi-arid regions, and some along important trading routes. The castles were built roughly between 660 and 750, under the caliphs of the Umayyad dynasty who had made Damascus their new capital in 661. After 750 the capital moved to the newly-built Baghdad, and some of the buildings were never completed. Archaeologists have investigated the role of these desert castles, with the traditional view that they served as country estates or hunting lodges for the use of aristocractic families during the Winter season. However, recent scholarship has suggested a much greater diversity of roles, including as agricultural estates or military forts. The complex at Qasr al-Hayr al-Gharbi, for example, sits within a vast agricultural estate and the buildings include structures associated with the production of olive oil. The generic term, "desert castle," is not ideal, since it artificially separates similar qusur according to their location. Jordan possesses at least one urban Umayyad qasr on the Citadel Hill of Amman. 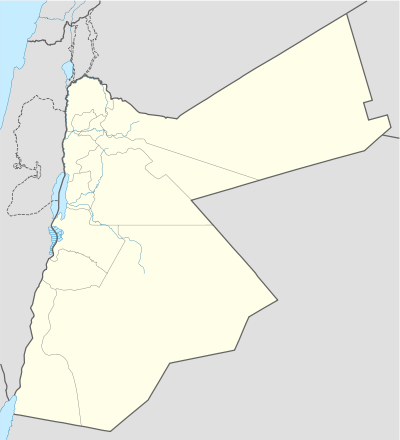 While the majority of qsar are located Jordan, examples can also be found in Syria, the West Bank and Israel, either in cities (Jerusalem, Ramla), in relatively green areas (Al-Sinnabra, Khirbat al-Minya), or indeed in the desert (Qasr al-Hayr al-Gharbi and Qasr al-Hayr al-Sharqi, Jabal Sais, Hisham's Palace). The more isolated "desert castles" built in arid regions, are chiefly located on the ancient trade routes connecting Damascus with Medina and Kufa or adjacent to a natural oasis. With a few exceptions, the desert castles conform to a common template consisting of a square palace similar to Roman forts ("castra"), a bath house, water reservoir or dam, and often an agricultural enclosure. Some of the desert castles, for example Qasr Hallabat or Qasr Burqu', are rebuilt from remains of earlier Roman or Ghassanid structures; others are new constructions. The function and use of the buildings are today not entirely clear, and scholarship has suggested that they might have served a variety of defensive, agricultural, residential, recreational and commercial purposes. Given the variety observed in the archaeological record, it is unlikely that one single theory can explain the range of purposes of all the buildings. These functions include fortresses, meeting places for Bedouins (between themselves or with the Umayyad governor), badiyas (retreats for the nobles) or caravanserais. A proliferation of desert castles appeared around the same time as the number of caravans increased substantially. Many seem to have been surrounded by natural or man-made oases and to have served as country estates or hunting lodges, given that hunting was a favoured pastime for the aristocracy. Their location along major routes and next to the very scarce water sources seems to indicate that they enabled the Umayyads to control the roads militarily, monitor and tax the seasonal movement of people and their livestock, and not least, impress travellers and local tribes with lavish displays of monumental architecture, baths and ponds in the middle of an arid landscape. The castles represent some of the most impressive examples of early Islamic art and Islamic architecture, and some are notable for including many figurative frescos and reliefs depicting people and animals, less frequently found in later Islamic art on such a large and public scale. Many elements of the desert palaces are on display in museums in Amman, in Jerusalem's Rockefeller Museum (decorations from Hisham's Palace) and the Pergamon Museum of Berlin (the Mshatta Facade). This page was last edited on 3 April 2019, at 13:19 (UTC).